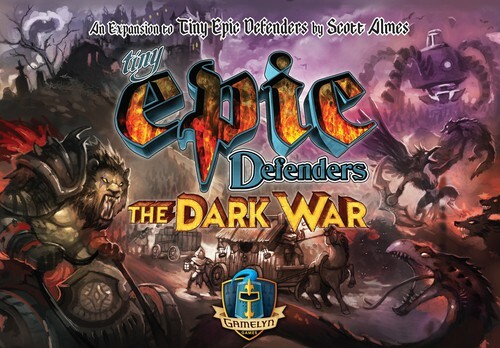 Tiny Epic Defenders: The Dark War is an expansion for Tiny Epic Defenders, designed by Scott Almes and published by Gamelyn Games. TED: The Dark War will launch on Kickstarter on Oct. 5th, 2017. All photos are from a prototype. 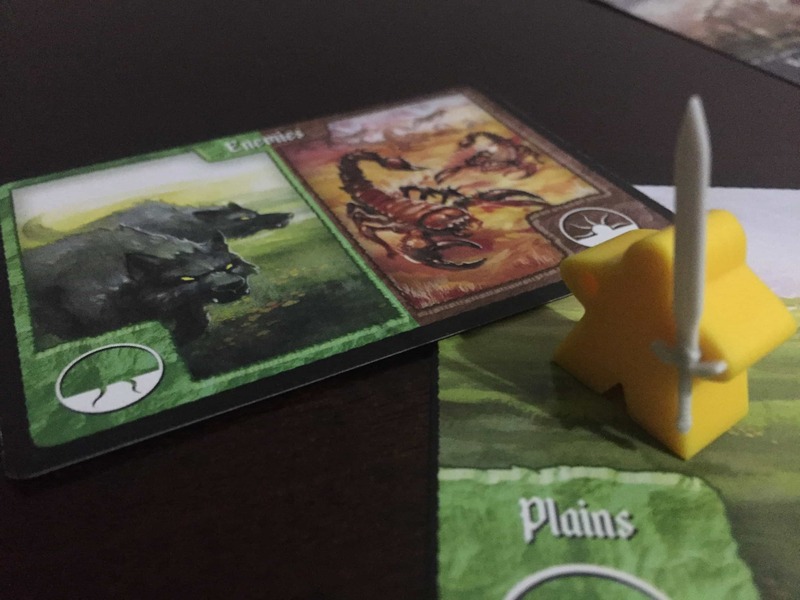 The Dark War expansion to Tiny Epic Defenders offers content which integrates into the base game fairly seamlessly, such as new characters, Epic Foes, etc. Yes, that means more ITEMeeples!! 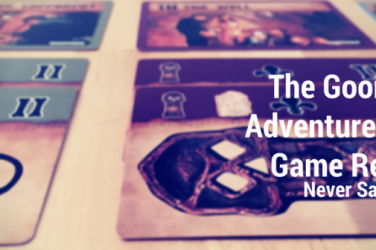 (check out my review of the base game for more details on that one). In addition, The Dark War also adds an additional game mode in which characters face greater, region-based challenges. However, to meet these new challenges, they will have the chance to level up and earn extra powers via a new skill system. Finally, if you chose, you could play a short campaign mode where character progression persists from game to game. So, do you need all of this new stuff? How does the new mode, including the campaign, measure up? New Characters: TED already ran through most of the basic fantasy character tropes in the base game. So, you’re getting some classes and races that might appear in an RPG splat book – Lionkin Charioteer, Pigfolk Gladiator, and the like. New Dire Enemies and Epic Foes: I saw that you could fight a Tyrannosaurus. How cool is that? I immediately made him the Epic Foe for my first solo game. New Artifacts: For the most part, you get more of the same. My favorite of the new items, though, has to be the Glaive of Return. This artifact allows you to defend for free, but then it flies to the Capital. Finally, an item that encourages players to share their wealth! Every character can now earn xp in order to become more powerful. 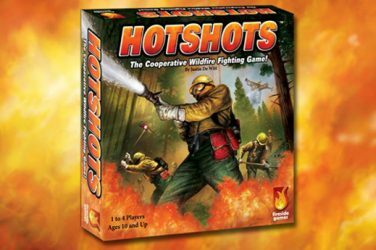 At the start of the game, you will receive a skill card which depicts a unique player power. Think of your skill card as a second character ability, only you spend xp to use it, rather than an action. You gain xp in multiple ways – defending, escorting villagers (more on that below), and defeating the Epic Foe. You can also just use an action to gain xp. Once you gain 8 xp, you can level up and get another skill to use. In this way, you can choose between saving xp to gain powers, or spending it and activating powers you already have. Speaking of villagers, you now have to save villagers along with protecting the capital! 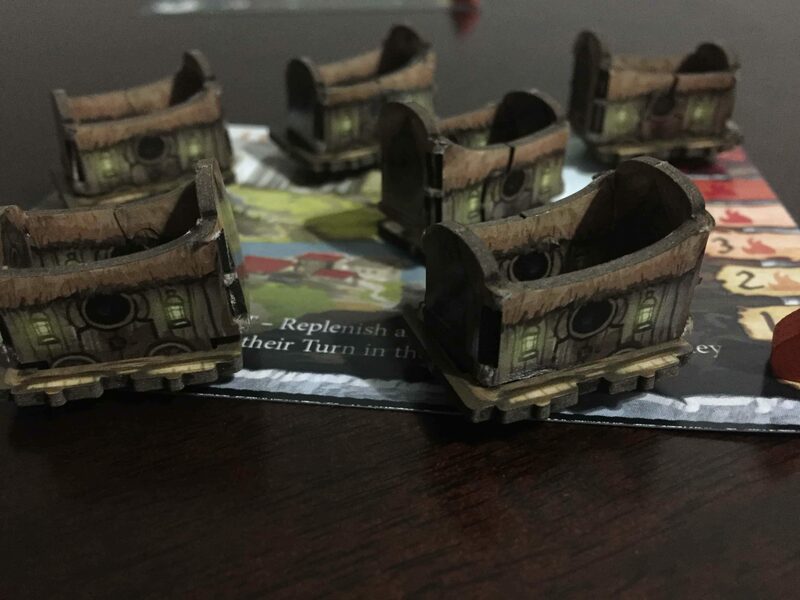 TED comes with six little cardboard wagons that will spawn in the six Outer Regions throughout the course of the game. You cannot win the game until you’ve escorted all six villager caravans to the Capital City. The villagers provide no in-game benefit; they are there strictly to be saved. TED also comes with six alternative Outer Regions. At the beginning of every game in this mode, you will choose one of these regions randomly and play it on its “hostile” side. That region will offer extra resistance to your efforts such as a rampaging manticore or random barbarian attacks. You will, at most, face one of these hostile regions in any game. Each of these new regions also has a “friendly” side which provides minor benefits, one of which will be available to you in a normal game, as well. Finally, a campaign mode allows you to play an arc of three separate games which will build upon one another. The good news is that you get to keep your artifacts, and hostile territories become friendly. The bad news is that another area will become hostile, more villagers pop up who need saving, and you will have to face new sub-bosses, called Generals, on your way to facing the Epic Foe in your third game. I admit that I don’t usually pay attention to precise issues of balance and relative power levels when I play an expansion. Instead, when I shuffle in extra content, I only want to insure fun, a good flow, and lack of obvious power creep. With that caveat noted, I did not notice any outstanding power creep or lack of balance issues with The Dark War’s extra content. I was happy to shuffle it all in and not think twice about it. Please look out for other reviewers who have a better eye for this stuff, if you want to know more detail. 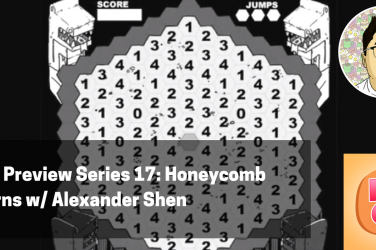 With regard to the new play mode, I love it when designers use expansions to subtly address issues people had with their base games. Eldritch Horror offers an example of an expansion element which fixes an issue in the base game, but in a clumsy way. In base Eldritch Horror, you could experience turns where you had no good options to use your available actions. Maybe you were too far away from a monster to move and attack it, or you didn’t have enough dice to attempt to buy stuff from the market. One of the expansions added Focus tokens, which allowed you to use an action to store a reroll for later. Brilliant! It’s so brilliant, it should have been in the base game the whole time! The Dark War fixes a similar problem in base TED, but in a much more elegant way. Sometimes, the turn order deck created situations where there wasn’t much to do on a turn. You mostly just mozied around and positioned yourself to defend against a monster. The Dark War, however, adds all sorts of stuff you could do! If everything’s fairly quiet, you have villagers to save. Also, you could spend your turn trading actions for xp and level up that way (btw, theme wise, how does that work? Do you smash a few squirrels to gain valuable experience right before a monster shows up?). The skill system itself creates a fair amount of extra overhead. I don’t know that I would recommend integrating The Dark War to a group of players who were wholly new to the game. However, once my play groups got into our Dark War plays, they were able to adapt to the additional levers on their character fairly smoothly. In addition, some people were iffy on having to choose between spending xp on skills and saving it for leveling up. They wanted to do both! However, we found that the TED skill system put some reins on the amount of complexity heaped on players throughout the game. They were, therefore, able to incorporate their new skills at a steady, digestible rate. Finally, I enjoyed how the new regions provided resistance without completely overshadowing the main threat, which come from the turn order decks. I didn’t enjoy all of new regions; for example, the desert emits sandstorms which act as resource sinks (actions and skills). I found that one to be a little dull. However, the Manticore from the mountain was really fun. That dude chases people around, which led to people rethinking their turns when they next came up. It also looked cool on the board. To be honest, I liked almost every addition they made… except for the campaign. Generally, I REALLY love campaign modes in games. 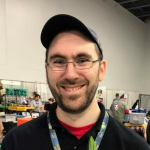 I rank Gloomhaven, Pandemic Legacy, and a few more among my favorite games of all time. 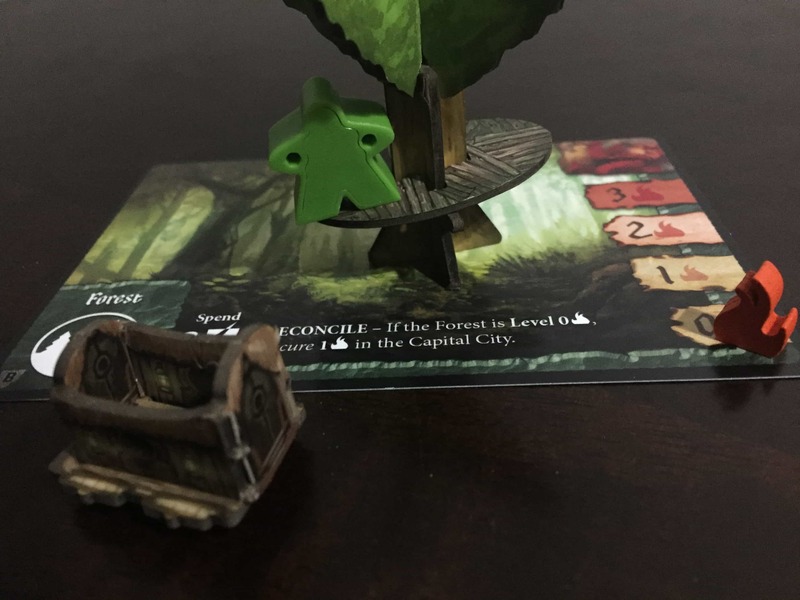 So when I heard that Tiny Epic Defenders was going to include a campaign mode, I got very excited. 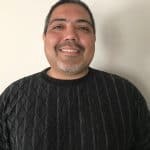 However, The Dark War doesn’t present a campaign more than it presents the opportunity to play three times in a row, with minimal agency along the way. The main thing The Dark War campaign offers is more time to play with the items and skills you acquire in a full play of the game. Single games generally end too early to really enjoy the cool stuff that you’ve earned, so it’s nice to have the option to keep going. When I think of a campaign, though, I think of progress of an overarching story, not just my own character progression. Besides the character, everything else changes randomly from game to game. New dire enemies get shuffled into the deck… randomly. A different Outer Region becomes hostile… randomly. I find it nearly impossible to imagine a growing story amid this amount of randomness, even if my little guy keeps the same stuff. I think there are ways for TED to tell a story over multiple games without having to rely on a bunch of flavor text. For example, you spend three games defending the same city. I think it would be cool if players could exercise some agency and upgrade the city, or at least the Outer Regions, in some way. Instead of the cardboard wagons. I’d love to see little structures you could add to the city that beefed up its defenses, or that provided a new ability that everyone could access. Heck, we’re already rescuing villagers, which is a mechanism I find very fun. Let’s put them to work making Capital City great again! (Sorry, I had to). 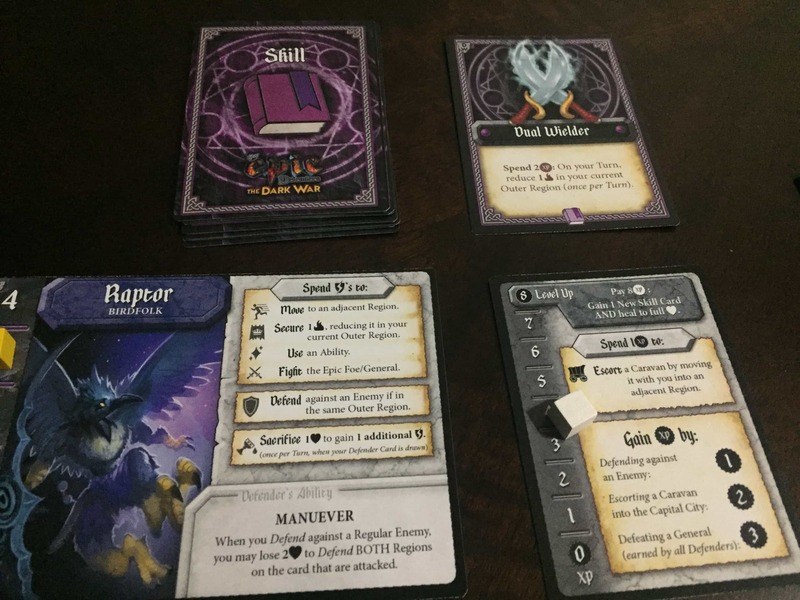 Final Verdict – Should you back Tiny Epic Defenders: The Dark War? 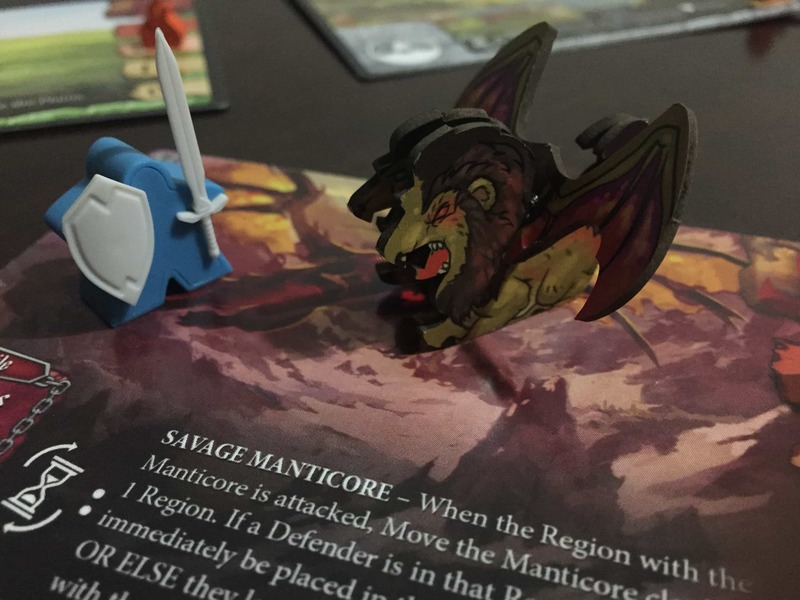 I have enjoyed Tiny Epic Defenders since its release in 2015. I acknowledge the game’s flaws, but I still have a good time with it. As I shared in my other post, I think the upgrade to the base game changes and adds enough to justify its cost. 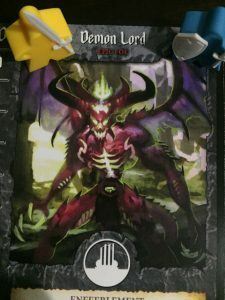 The Dark War adds a lot of neat stuff which, while it increases the game’s mental overhead, also gives you fun options to consider on every single turn. So even though I’m disappointed in the current state of the campaign mode, I plan on backing the project and seeing how it develops over the course of the KS campaign.